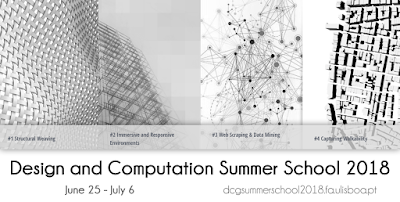 The Design Computation Summer School 2018 is an initiative of the Design Computation Group (DCG) of Faculdade de Arquitetura, University of Lisbon. It will be a space for discussing new ideas and new applications of advanced concepts in architecture and urbanism by exploring given tools and methods. The main idea of this set of workshops is to share advanced knowledge on the related subjects and get feedback from the participants. The workshops will not only provide the knowledge but also could allow contributions and eventual future collaborations with the participants. when is the workshop being conducted? It is between 25th of June and the 6th of July. 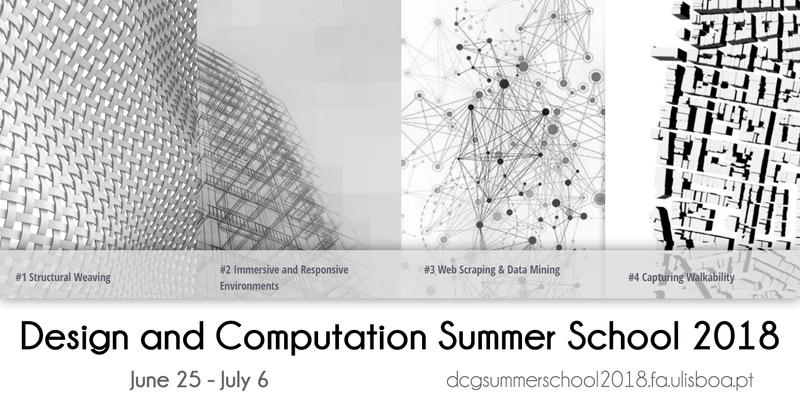 Visit http://dcgsummerschool2018.fa.ulisboa.pt for more details.